It was a Monday at work a couple months ago and I decided to chat with my wife on Gtalk so I could ask her what I need to buy from the grocery. Google has a handy way of chatting with other Gtalk members by integrating a java client right into Gmail which I’ve done hundreds of times before. To my horror my company firewall had been changed to block the client’s web traffic. I immediately thought let me pull out my trusty Android phone since I’m sure I could find an Android app to solve my problem. So I download and install it which did not take too long (less than a minute). I see that it is very intuitive and easy to use right away. 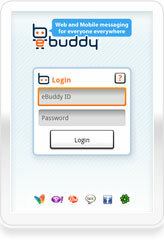 When you open the app the program simply asks you to create an eBuddy ID so it can virtually handle your chats. Once logged in it asks you what chat you want to use, a username and password for it, and your in! It has an option to do all this automatically after setup so you don’t have to do it everytime. I then take a look at the interface and see that it is very thorough in the features it offers. It has built in emoticons (those silly guys you type to explain your emotions :P) so you don’t have to write them out all the time. You can clearly see the status of all your friends like if they are busy, offline, idle, etc. Last but not least, and perhaps one of the best features I’ve seen on a mobile app in a while, is that you can be logged in to multiple chat clients at the same time. So I could be on MSN, Gtalk, ICQ, and Facebook and chat with every person at once! It’s almost like a conference call for chats. The last thing I’ll mention is that the app has a neat little feature that will make your phone buzz or beep when you receive a new instant message, just like you would a text message. It even gives you a summary of the message up at the top of your phone in the menu bar. Over all for a chat client I have to say this little eBuddy of mine performs quite well. It loads fast and doesn’t lag, lets me talk to all my friends at once, and makes for an easy way to get around my firewall at work. Poke A Mole, because moles are EVIL!